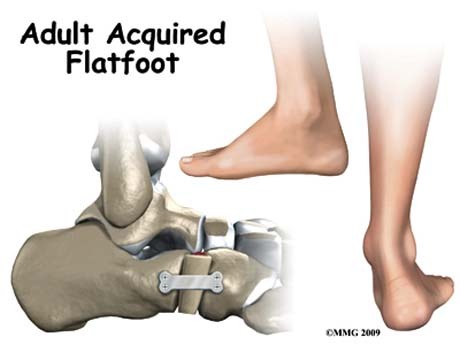 FLATFOOT IN ADULTS | GEORGE D. GOUDELIS MD. Ph.D. The lack of the foot arch is a clinical entity that employs except children and adults. The majority of adults indicate no pain or dysfunction of the feet during walking and performing occupational or sports activities. The proportion of the flat foot adults reaches 20%. Usually adults with flat feet are those who had in their childhood and has not been restored at the end of time as observed in a large percentage of children (flexible flat feet due to general laxity of ligaments). But there are cases where the flat foot occurs during adult life as e.g. after pregnancy in women or a tendon injury in the foot. In most cases, flat feet are painless and there are patients reporting pain in the leg but and in other parts of the lower limb as knee, hip or lumbar area. Pain and swelling in the local area of the foot are the most common symptoms reported by the patient. The onset of pain but apart from the inner surface of the foot can be displayed across the foot, in ankle joint, calf, knee, hip and low back pain. The stiffness is another symptom reported by the patient perceives mainly during effecting walking, running or sports activities. Family history - fallen arches can run in families. Laxity of the ligaments. In these cases it is observed that the foot arch appears when the foot is not standing on the ground and disappears when the patient stands up and rests his feet on the floor. This suggests flatfoot due to generally loose joints in which when exercised its body weight during standing argue quite eliminating the arch. Damage to the posterior tibial tendon is the most common cause of AAFD. The posterior tibial tendon is one of the most important tendons of the leg. It starts at a muscle in the calf, travels down the inside of the lower leg and attaches to the bones on the inside of the foot. The main function of this tendon is to hold up the arch and support your foot when you walk. If the tendon becomes inflamed or torn, the arch will slowly collapse. Women and people over 40 are more likely to develop problems with the posterior tibial tendon. Other risk factors include obesity, diabetes, and hypertension. Having flat feet since childhood increases the risk of developing a tear in the posterior tibial tendon. In addition, people who are involved in high impact sports, such as basketball, tennis, or soccer, may have tears of the tendon from repetitive use. Inflammatory arthritis, such as rheumatoid arthritis, can cause a painful flatfoot. This type of arthritis attacks not only the cartilage in the joints, but also the ligaments that support the foot. Inflammatory arthritis not only causes pain, but also causes the foot to change shape and become flat. The arthritis can affect the back of the foot or the middle of foot, both of which can result in a fallen arch. An injury to the ligaments in the foot can cause the joints to fall out of alignment. The ligaments support the bones and prevent them from moving. If the ligaments are torn, the foot will become flat and painful. This more commonly occurs in the middle of the foot (Lisfranc injury), but can also occur in the back of the foot. In addition to ligament injuries, fractures and dislocations of the bones in the midfoot can also lead to a flatfoot deformity. People with diabetes or with a nerve problem that limits normal feeling in the feet, can have arch collapse. This type of arch collapse is typically more severe than that seen in patients with normal feeling in their feet. This is because patients do not feel pain as the arch collapses. In addition to the ligaments not holding the bones in place, the bones themselves can sometimes fracture and disintegrate - without the patient feeling any pain. This may result in a severely deformed foot that is very challenging to correct with surgery. Special shoes or braces are the best method for dealing with this problem. Pregnancy. Pregnancy can affect the foot arch in two ways. Initially increased body weight in conjunction with relaxation of the ligaments because the new hormonal balance due gestation observed reduction of arch in pregnant women. Diseases of the nervous system such as cerebral palsy, muscular dystrophy, spina bifida are diseases associated with occurrence of flat foot. Age and wear and tear - years of using your feet to walk, run, and jump eventually may take its toll. One of the eventual consequences could be fallen arches. The posterior tibial tendon may become weakened after long-term wear a tear. bony abnormalities, eg rotational deformities, tibial abnormalities, coalition (fusion) of tarsal bones, equinus deformity. The clinical examination is conducted by the Orthopaedic surgeon and based on observation of the patient during STANDING, in the raising and lowering of the stairs, and under non-weight bearing condition of the foot. The patient stands on toes and Orthopaedic surgeon observes whether formed or not the arch. Should not the arch created by this move then the rigid flatfoot is the most obvious reason. To investigate whether the cause of the flat foot is damage to the posterior tibial tendon of the Orthopaedic surgeon asks the patient to lift the toes of one foot without rest for 10 consecutive times. If the person can not perform 10 reps then the problem focuses on the posterior tibial tendon. During palpation found loose or rigid nature of flat foot and whether painful or painless is during effecting of anatomical motion. Also investigated coexisting problems such as calluses, ulcers, toe deformities (valgus great finger, hammer toes, etc.). The clinical examination is completed by controlling the ankle, knee and hip joint. The plain radiographs -X-rays- of the foot with the patient in an upright position, the first choice for the investigation of the flat foot, labeling and measurement of disturbances of mechanical axes of the foot, based on the creation of the patient's treatment plan. MRI evaluate the condition of the tendons and especially posterior tibial muscle tendon, ligament structures and any concomitant problems of articular cartilage in the foot and ankle joint. The foot analysis is an important tool for evaluation of flat foot during postural (static mechanical and electronic foot analysis) and the configuration of the foot during the gait of the patient (dynamic, electronic pelmatografima). Developments in technology now enables the specialist Orthopaedic surgeon to understand the loads exerted on the foot and plan more accurately the way of treatment. The static and dynamic foot analysis are the development of electronic technology in the evaluation of the approach of the feet in the ground during stance and gait. WHEN THE TREATMENT IS NECESSARY AND WHEN NOT? 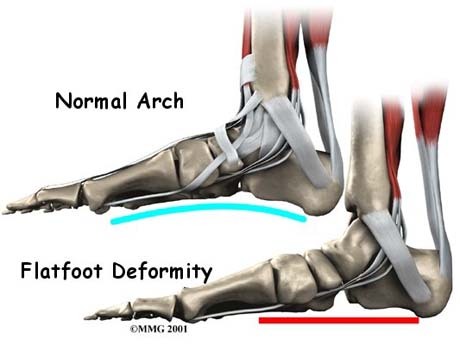 The arch may develop spontaneously in children under 10 years with flexible flatfoot and no other relevant condition. In adults, a 'good' flatfoot is one which has has been present a long time, is flexible, bilateral, painless, and not progressing. if the patient has another disease which may be contributing (eg neuropathy or inflammatory arthritis). There is tibialis posterior dysfunction. This should be treated in its own right: treatment may involve rest, non-steroidal anti-inflammatory drugs (NSAIDs), orthotics or surgery. 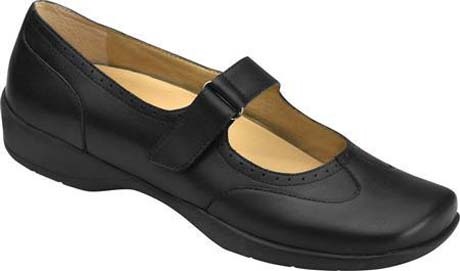 The pain appears in the feet in patient with flatfeet can be alleviated with the use of special shoes which support the foot arch and are spacious in the front portion (toe area). The application specific insoles which enter inside the shoe and support the foot arch, it can relieve the patient from the symptoms of pain. Such specific insoles are made after the completion examination and supervision of Orthopaedic surgeon. The application of special insoles are not indicated in patients with short Achilles tendon as it may cause worsening of symptoms. 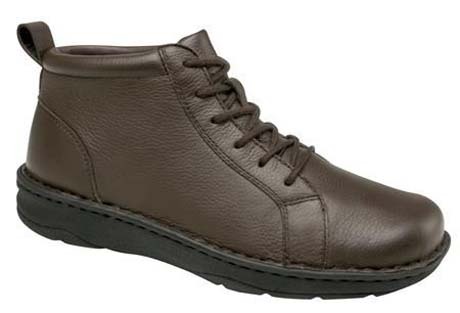 In cases of rigid flat foot and arthrosis (rheumatoid arthritis), use special footwear can provide relief. Special insole which was created after the completion of the individual examination. Using ankle splint in patients with inflammation of the posterior tibial tendon is effective. 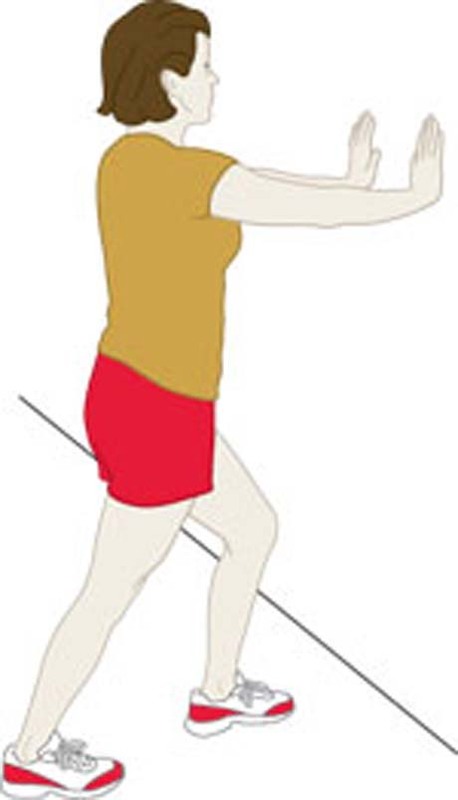 Achilles tendon stretching exercise program is essential to address the short Achilles tendon. Initially the program is implemented by the physiotherapist and then by the patient himself to intensive basis. The weight loss in overweight people helps in partial unloading the feet and the relief of symptoms in a high percentage. Training of the foot muscles. Recommended walking without footwear, walking on tiptoe and heels, several variations to involve all muscle groups of the leg resulting in such training. Today there are surgical techniques that address the problem of flat foot with great success. 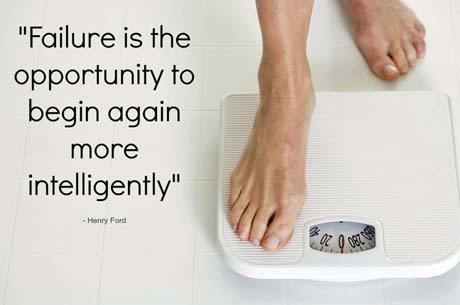 The cornerstone of success is to identify the cause of the flat foot. Patients with cerebral palsy with pes planovalgus. Rupture or dysfunction of the posterior tibial tendon where conservative treatment has not brought the expected results. 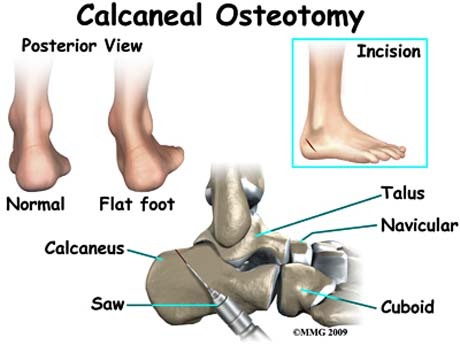 The principle of the calcaneus osteotomy is to shift the tuberosity medially, thereby altering the axis of pull of the Achilles tendon on the hindfoot. 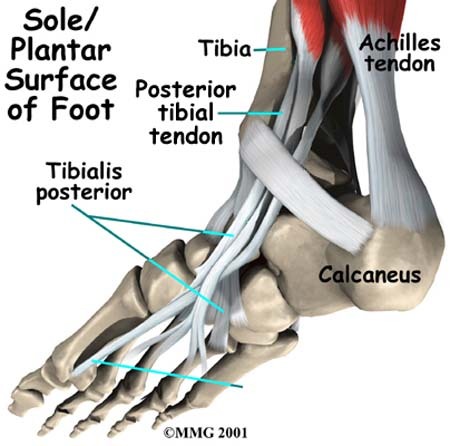 As the tuberosity shifts medially, the Achilles tendon is now slightly medial to the axis of the subtalar joint. Usually combined with flexor digitorum longus transfer. This method is applied alone or in combination with the osteotomy of the calcaneus to reach as far as possible the correction of the deformation of the foot.